You will also note that ARP® offers specially undercut studs for several engines. This procedure (done only to the shorter studs) more equalizes the "stretch" of both studs, which makes for a more consistent clamping force, one that compensates for head gasket compression when the head is installed. This helps prevent blown head gaskets, and assures optimum sealing! Premium parallel ground washers are also included with each kit. The Pumaspeed Workshop team are ready to fit the ARP Main Stud kit to suit all 2.0 and 2.3 Ecoboost in our Head Office located here. Therefore making parts and labour a total cost £778.99 (inc. VAT). 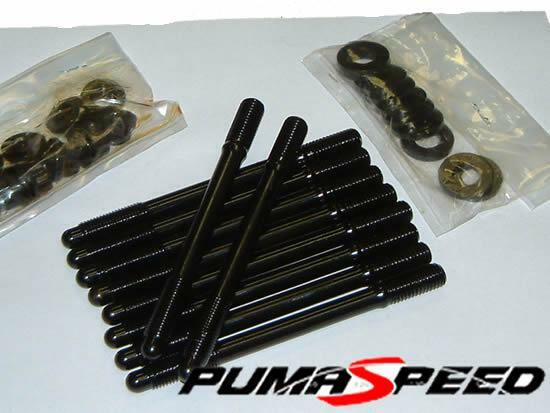 Pumaspeed have a specialist distribution team that can dispatch the ARP Main Stud kit to suit all 2.0 and 2.3 Ecoboost to any destination worldwide.